Whatever your business, Phoenix Terminals has a card payment terminal to meet your needs - mobile, static, Bluetooth or Wi-Fi. Fast and secure, our card payment terminals can actually help save you money, by using broadband or mobile technology, rather than an expensive landline. 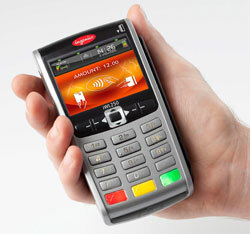 We are an independent supplier of payment terminals. When you buy or hire a machine from us, you are not tied to one acquirer for the life of the terminal. Rather, you are free to move between Merchant Service providers in order to get the best deal on transaction rates. Whether you want to replace your current terminal, hire a machine for an exhibition or outdoor event, or simply wish to take credit and debit card payments for the first time, our experienced, friendly team will be happy to help.